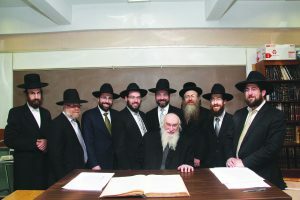 Hagaon Harav Yisroel Belsky, zt”l, with the Choshen Mishpat chaburah; Rabbi Tzvi Kramer is second on the left. Rabbi Tzvi Kramer has been a talmid of Yeshiva Torah Vodaath for nearly half a century. During this time, he has learned from the great Roshei Yeshivah who have led the yeshivah, including Harav Reuven Fain, zt”l, Harav Avrohom Pam, zt”l, and Hagaon Harav Chaim Yisroel Belsky, zt”l. For the past 10 years, he serves as the Rosh Chaburah for the Choshen Mishpat Kollel, a project started and guided by Rav Belsky, and generously sponsored by Mr. and Mrs. Shlomo Yehudah and Tamar Rechnitz. These distinguished yungeleit, the pride of the yeshivah, have developed into dayanim who had hands-on training with Rav Belsky and carry on his legacy. My great-grandfather, Reb Yitzchok Aharon Kramer, z”l, was involved in the yeshivah in its infancy. He ran a gemach in Williamsburg, and often helped cover the payroll checks for the Rebbeim. In fact, the yeshivah ketanah building was dedicated in his name by my uncle, Reb Aryeh Leib, z”l. My father was a talmid of Torah Vodaath from 1936 until 1942, when he was sent by his brother to Telshe Yeshivah in Cleveland. Growing up, we lived at 195 Division Avenue, which was across the street from the yeshivah located on Wilson Street. It was natural, given our family connection and proximity to the yeshivah, for me to become a talmid. I literally walked across the street to yeshivah. When the elementary school moved to Kensington, I traveled there by bus, but once I entered Torah Vodaath, I never left. I’ve been a talmid from preschool through kollel. My Rebbeim in beis medrash left the biggest impact on me. Harav Reuven Fain’s, zt”l, hasmadah was a sight to see, and hearing his shiurim was like hearing Torah miSinai. The fire, the kedushah, it made you feel that you were part of the mesorah of Torah through the doros. I also received semichah from Rav Avrohom Pam and he was my mesader kiddushin, but he taught us more than Yoreh De’ah. His taught us, both in his shmuessen and in life, what true bein adam lachaveiro means. For the past 25 years, I have given chassan shiurim based on Rav Pam’s mehalech. He often stressed that a person must have what the Mesillas Yesharim calls mishkal hachassidus, to weigh your righteous actions to see if they are proper. Sure, you want to do chessed and help your friend, but if your wife spent hours preparing supper and you come an hour late, it is not the proper thing to do. Rav Pam’s lessons are a guide for life. I was also zocheh to have a close relationship with Rav Belsky. He always encouraged us to have a broad hekef, to expand our knowledge in Torah to all areas. It’s not enough, he would say, to have just the basics of the few masechtos you learn in yeshivah plus some basic knowledge in Orach Chaim. We began with the third part of Choshen Mishpat, since that part is most relevant to dinei Torah, and eventually we learned it in its entirety. Rav Belsky guided us and taught us the practical applications of each halachah, and we received semichah of Yadin Yadin. We even continued on to learn Even Ha’ezer. Rav Belsky pushed us to broaden our goals, and with the generous support of his son-in-law and daughter, Mr. and Mrs. Shlomo Yehudah and Tamar Rechnitz, the chaburah is still continuing 10 years later. After you learned Choshen Mishpat, you joined Rav Belsky’s beis din and sat with him as he presided over dinei Torah. How was that experience, sitting with your own Rosh Yeshivah on a beis din? Rav Belsky always stressed not to rush to judgment, and to hear all the details before rendering a psak. We did not stall, but he urged us to continually process each point of information and review it well in our minds over and over again so that we could come to a clear ruling. He would listen and discuss with us our feelings about the case, and never negate our opinions. He never insisted, “kablu da’ati — accept my view”; rather he listened, discussed, and heard all the proofs and thoughts that we had on the matter. If it came out that the other two Dayanim disagreed with his view, he would defer to them. That was his true gadlus. At times, the psak would go against one party, and although he kept to the din, since one cannot exercise mercy in such cases, nevertheless he would try to alleviate the outcome for that party if it was warranted. As an example, there were cases where a tenant owed rent, and the landlord wanted him removed from the premises. Although the din was on the landlord’s side, he would urge us to see if we could raise some money for the tenant to help get him back on his feet. During the days before Sukkos, I sell arbaah minim in the yeshivah, and I was right down the hall from Rav Belsky. I once took a bunch of esrogim to him and asked him to teach me which ones were acceptable. He took the time to show me all the different levels, from what is mehudar to which ones are kosher enough for chinuch so that one is permitted to recite a brachah on them. What special character trait did you gain from Yeshiva Torah Vodaath, which you feel is unique to the Yeshiva Torah Vodaath talmid? Yeshiva Torah Vodaath is famous for being accepting of all types, and everyone finds his place. There is no gaavah, as the younger and older talmidim join together in their learning and shteiging. In fact, although my son wants to go learn in Eretz Yisrael, I wanted him to first experience the special ruach of Torah Vodaath before he leaves, so he is now learning in the beis medrash. To continue transmitting the mesorah of Torah in the next century with the unique warmth and breitkeit which is its hallmark.